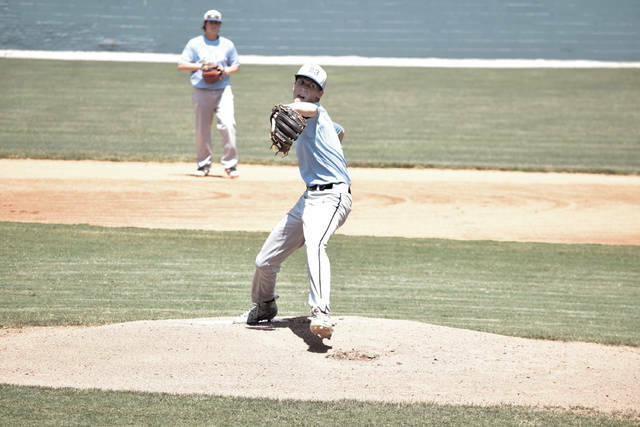 Post 23’s Tanner Kimbler throws a pitch on Saturday afternoon. Post 23’s Will Darling stands in at the plate. Post 23’s Cole Dyer sprints home on a wild pitch. Dyer went 2-for-4 with a double, three RBI, and a run scored in Portsmouth’s 6-2 victory over the Ohio Force 17U squad. The game of baseball is, as most people say, a very funky, weird game. A team can do everything right and not get the breaks that it needs, or do everything wrong and get every break in the book. 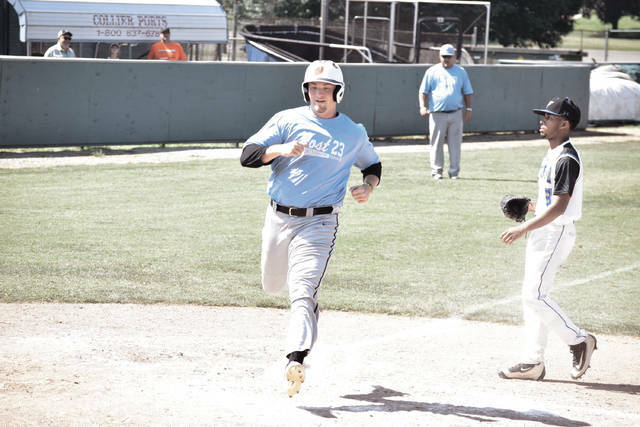 In a Gene Bennett Baseball Classic Quarterfinal contest on Saturday afternoon, however, Post 23 did everything right — and even got a break to go its way to help kickstart yet another winning effort. 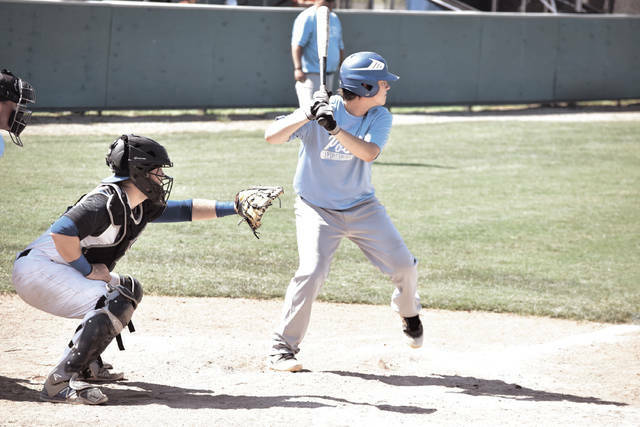 With Willie Cruz on second base and just one down in the bottom half of the second frame for the Ohio Force 17U program, Tyler Hunter looked to have a no-doubt RBI on a base hit back up the middle. Is Gene Bennett on Post 23’s side? It certainly felt that way on Saturday, because from there, Post 23 never looked back. In all, Portsmouth scored all six of its runs between the third through fifth innings while Ashkettle and Davis added two diving catches in the outfield in the fourth frame that were also web-gem worthy as Post 23 — who committed only one error all game — advanced to the final day of the Gene Bennett Baseball Classic with a 6-2 victory over the Force program on Saturday at Branch Rickey Park. As has been the case for Post 23 all throughout the GBBC, it was the attention to detail in all three phases of the game that really impressed third-year leader Matt Miller. After both teams went down in an innocent fashion to begin the contest, Cruz’s leadoff single and stolen base in the second frame put the 17U Force in an excellent position to strike — and it looked to be a certainty when Hunter used his quick hands to shoot a ball back up the frame. But as if Gene Bennett was looking down upon the hometown unit, the ball took a wild bounce off of the second base bag and launched in the air at a 45 degree angle right to Darling, who fielded the ball cleanly with his bare hand. The junior-to-be, like he had been making the play his entire life, then did the Wheelersburg graduate and legendary figure proud by making an off-balance throw, away from his body with said bare hand, for the out while stranding Cruz at third base. Tanner Kimbler followed by striking out the next batter, Javier Carabello, to round out the top half of the second frame in style, and from there, the game was on. In the bottom half of the third inning, Post 23 found additional momentum via two-out lightning. With one gone, Jarrett Stamper reached on a ball that landed fair down the right field line, and stole a base to move into scoring position. Two batters later, Brayden Davis was hit by a pitch with two gone, which put Cole Dyer up at the plate, and true to regular form, the latter didn’t disappoint the pro-Post 23 crowd as his single down the left field line, which followed a wild pitch, scored Stamper and Davis from third and second base, respectively, as Portsmouth took a 2-0 lead after three innings of play. If one thought that Portsmouth would relent a bit with a lead in its back pocket, that person only had to look to the following half-inning to know that wouldn’t be the case. On back-to-back plays, Brayden Davis and Jake Ashkettle built on Darling’s excellent defensive play as Davis, seeing a well-hit baseball all the way in left field, extended fully to make a fantastic catch in left field. After Davis, who was shaken up a bit on the play, stayed in the game following a quick check-up, Ashkettle then followed by covering a good 60 feet to make a diving catch of his own in shallow center field — all despite playing out of position — to aid relief pitcher Kyle Gammon along. Post 23 didn’t give up a single hit between the third through sixth innings as a result of a defense who played entirely clean baseball over the first 20 outs of the affair. As the defense and the pitching — who, between Kimbler, Gammon, and Dyer, only allowed five hits over the seven-inning affair — continued to control matters, Portsmouth wasted no time adding onto its lead. A leadoff single by Tyler Speas in the bottom of the fourth, along with a stolen base, allowed Will Darling to drive home a crucial insurance run with his base hit up the middle as Post 23 took a 3-0 lead, then Portsmouth took advantage of a critical infield error as Dyer — who led Portsmouth by going 2-for-4 with a double and three RBI — roped a hard-hit double to score Davis. Dyer then followed by obtaining a sizeable leadoff on his way to third base, and never stopped from there as a wild pitch allowed the Wheelersburg grad and Rio Grande signee to sprint on home from second base as Post 23 took a 5-0 lead. However, Post 23 wasn’t finished. Gammon, who walked and stole second base, was followed by Reid Shultz, who singled to right field to move Gammon over to third base. When Shultz attempted to, and successfully stole second base, Gammon moved on the throw and stole home in a successful double steal to round out a vital three-run inning for Post 23 as Portsmouth took a 6-0 advantage. After three successful relief innings, Gammon gave way to Dyer, who threw the seventh frame for Post 23. The latter, who sat down two of the first three batters that he faced, ran into trouble as a leadoff single by Ryan Marflake, another single by Cruz, and a passed ball on a third strike allowed Hunter to drive in Marflake, while Cruz came home on the same play via an error, but to his credit, Dyer rallied the troops, and retired Javier Carabello via a 5-3 groundout to allow Post 23 to advance to the Gene Bennett Baseball Classic semifinals. Both teams’ common opponent is the Ohio Force 17U. Post 76 defeated the 17U Force by an 8-2 tally at the start of pool play on Thursday while Post 23 defeated the 17U Force by a 6-2 margin in Saturday afternoon’s quarterfinal matchup at Branch Rickey Park. Gammon and Post 76’s Collier Wireman, who both signed to play for Chris Moore’s program at Shawnee State University, are a combined 12-of-23 in GBBC action. Both players have six hits apiece entering Sunday’s semifinal matchup.